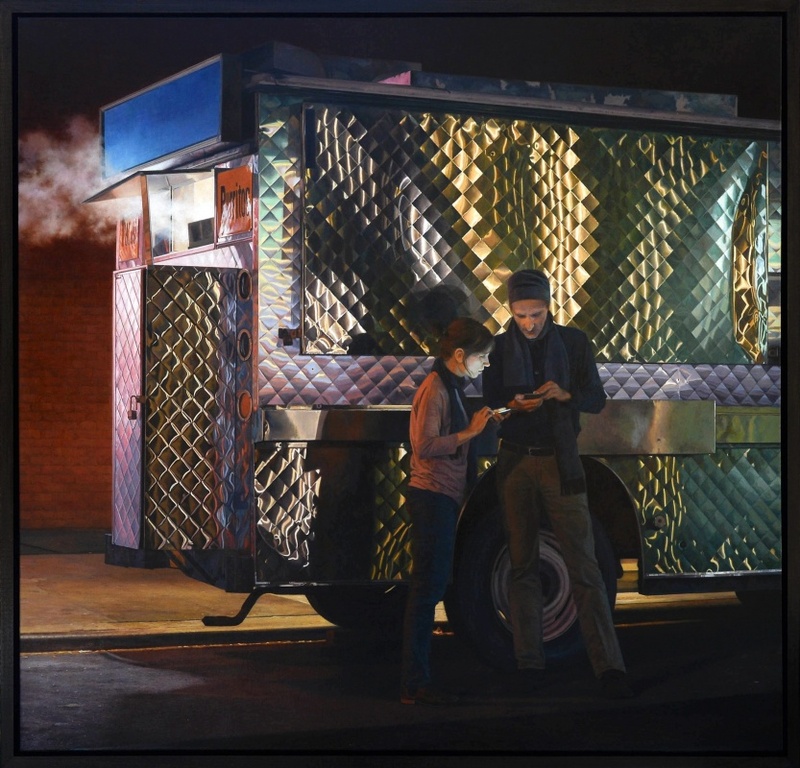 Stephen Fox’s photorealistic approach to painting renders nighttime scenes eerily dark yet charged with light. Glowing with the beams of car lights or orange sunrise, the oil paintings peer into the mysterious, almost fantastical nature of night. Fox’s color palette heightens light and atmosphere as warm yellows exerted an arresting contrasting among deep blues and violets. Inspiration originates from a snapped photograph or reoccurring dreams depicting dim phone booths, roadways, distant cities, and slick streets. Usually devoid of figures, the landscapes present a striking stillness reminiscent of 19th century Romantic landscape paintings, yet infused with a modern perspective. Fox was born in 1957 in Richmond, where he received his Bachelor of Fine Arts from Virginia Commonwealth University (1980). He completed his Master of Fine Arts at the Maryland Institute College of Art (1997) and later moved to Brooklyn, where he currently resides. He has exhibited at Arcadia Contemporary, O.K. Harris Works of Art, both, New York, NY; Galerie de Bellefeuille, Montreal, QC; Tucson Musuem of Art, AZ; Posco Gallery, Seoul, SK; Virginia Museum of Fine Arts, Richmond, VA, among others. His work is included in several permanent collections such as CSX Corporation, Ethyl Corporation, Virginia State Bar, and the University of Virginia School of Law.